Ta en tur i den grekiska underjorden - bokstavligen - med denna guidade båttur på den underjordiska sjön Melissani. Drick sedan i det fantastiska turkosvattnet i Myrtos Beach, en av de mest fotograferade stränderna i världen. I would not recommend this trip or the provider. We were a group of 35 people who booked this trip - expecting as advertised: Boat ride to underground lake Melissani and a trip to Myrtos Beach Enjoy the ride in the spectacularly colorful Melissani Lake, a colorful underground body of water Spend some time lounging on beautiful Myrtos Beach. The bus that picked us up did not have air conditioning in the back of the bus nor did the speakers work appropriately. The tour guide heard our complaints about the air and the speakers and her response was I don't have a strong voice. 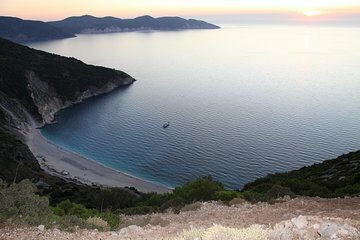 Instead of Lounging at Myrtos beach we stopped on the side of the road and took a picture of the beautiful beach. We were very disappointed by the tour because we did not have a properly functioning bus, or a tour guide that could project her voice enough so we could understand what she was saying. In addition to that we did not get to lounge on the beach as expected. The bus ride to the lake was approximately one hour, wait in line for 30 minutes for a 10 minute boat tour of the lake, quick stop at the photo stop and back - all in 3 hours. I would not recommend this trip if you want to actually go to the beach or ride in a fully equipped coach bus. Myrtos Beach was wonderful -- wear flip flops as the beach is extremely rocky! The Melissani Lake is a tourist attraction somewhat Disney-like with about a 7 minute boatride in a circle around an underground lake with stalactites and stalagmites all around. Interesting to see but a long drive for such a short time there. It was a shame as we had travelled at least 35-40 minutes. and then back again. We didn't know what to expect, we thought we were going on a coach trip, and with it being hot, we thought it would be too much. John met us with his lovely air conditioned car, very friendly man. He took us on a tour of the island, he was very knowledgeable and showed us hidden treasures. We stopped for lunch, had a lovely time. Location was extremely hard to find due to little instruction provided by Viator and we almost missed the coach! As it happens the trip was fairly interesting although we couldn't really hear our guide on the coach. All in all you could hire a car and do the same trip and photo stop including visiting the caves for a fraction of the price.